Well of course they make hardware base pieces so that one can make their own custom hardware knobs and pulls. You better believe that when I figured that one out I knew exactly what I was going to attach to those little bases. I have always been obsessed with natural curiosities..especially rocks and fossils. From a very early age I remember my Dad picking up and collecting rocks where ever our travels took us. I know that his fascination was definitely passed down. Now I smile when my little girl brings me a rock (on a daily basis) that she finds and thinks is the most valuable treasure. In fact if she could go to any store with me she would pick the mineral and bead shop. No doubt about it but nature brings about the best inspiration...I am in constant awe of it and its Creator. Just follow the directions of the epoxy and glue together. 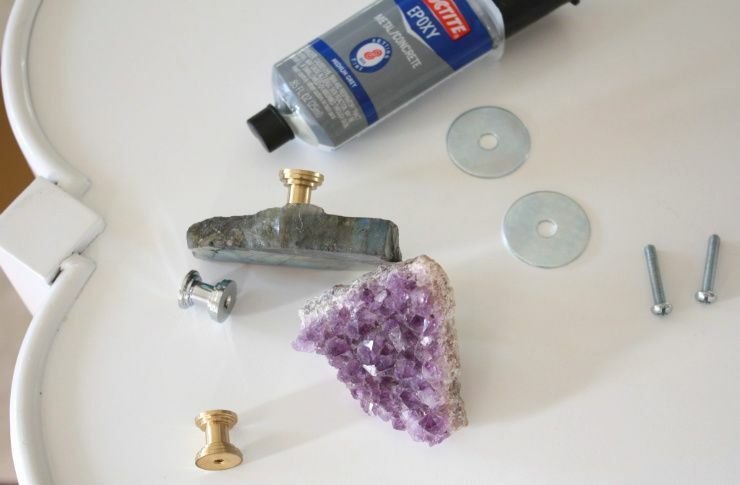 I used the washers because I thought it gave more flat surface space to work with being that the amethyst rock was not completely flat on the back. I can't wait to show your where my new hardware lands..stay tuned. I am not mixing the two different rocks so now I need to decide what rock will look best with my newly lacquered piece of furniture. P.S. - Every single morning we get this fantastic rainbow coming from the morning sun when it hits the crystal lamp in the girls room. It is quite the cause for excitement with the kids. Don't you love how kids find everything so magical? Love it....what a cute idea! Awesome! 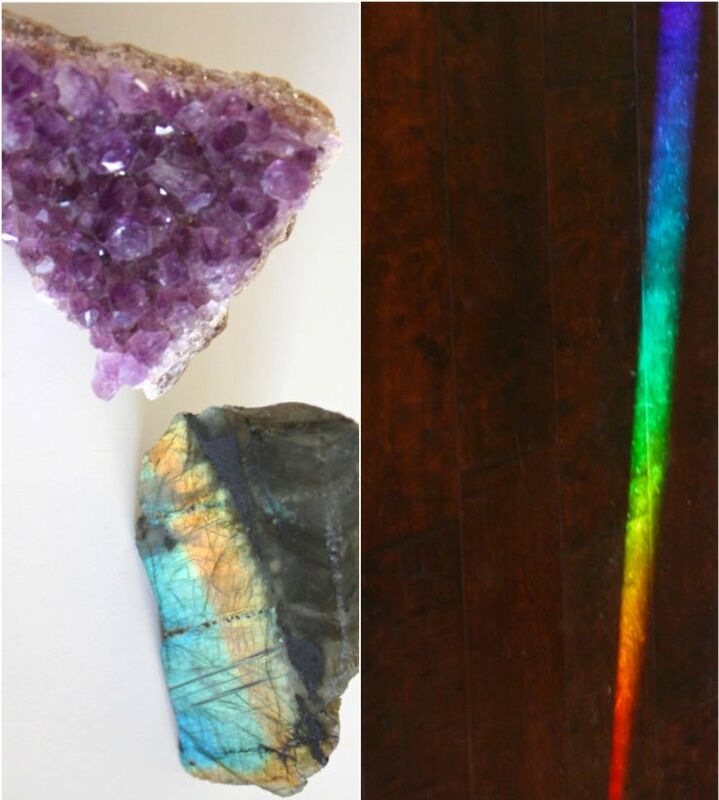 That is such a great way to bring color and gems into your home instead of just having them displayed on shelves. Great thinking!! That is so cool, I had no clue they sold base only. Thanks for the sharing! What a lovely idea! Can't wait to see the pictures of the finished product! Great idea. I have a collection of beautiful rocks and am tired of just displaying them as rocks! Would rather have them ornamental and useful! YAY! YOU are a smart girl--I will be joining you in this endeavor! Brilliant! This is such a great idea! So fun! These are beyond cool..I have one little girl who would love me forever and ever if I would make these for her! brilliant idea ... can't wait to see how it turns out when it's all finished! You are seriously so clever! I cant wait to see where you use them! ahhh, I love yours even more than mine came out- and I cant WAIT to see where you put those babies, they are BEAUTIFUL! ooh, you are definitely giving me some inspiration for my next line of hardware!!!! 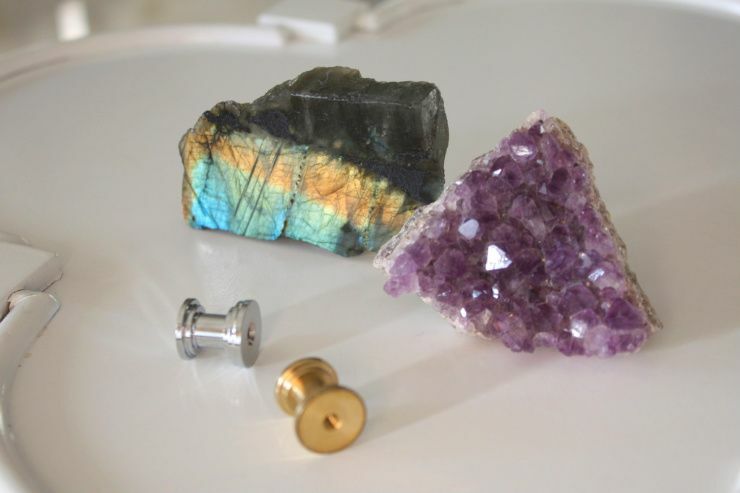 I have four mineral pieces sitting on my desk that I would love to turn into hardware knobs. What a great way to give my house a personal touch! Here is to a bright and happy weekend!